Used furniture buyers come in all shapes and sizes. From individuals looking for a single piece; to thrift, consignment and antique stores; to auction houses large and small. But no matter the person or venue, the one thing they all have in common is the desire to find a great deal. Whether you're scouring antique stores for the perfect piece of furniture, or you run a home-based business buying and selling used furniture for profit, you'll always be looking for the best piece at the lowest price. While the term "used furniture" can sometimes make people think of items that are rundown and decrepit, quite often the opposite is actually true. Depending on the age of the item, it's possible that it was made at a time when the construction was better, labor less expensive, and it may even be handmade. Often with some slight restoration, used items can look better than new items. There's also the elements of character and history that simply can't be found in new pieces. Used furniture buyers need to be able to determine what items have potential and what items are better left for the garbage. Learn what it takes to turn someone else's garbage into your own personal "treasure." A lot of people buy used furniture as a hobby, and as a result, flea markets, vintage sales, and antique shows are very popular. Some people enjoy it so much they turn it into a business. This hobby of used furniture buying can easily get people hooked. Some turn their hobby into a used furniture business, sometimes for the simple reason that they don't have enough room in their own house to hold their treasures. While renting a space and opening a store is a big undertaking, there are other ways to start a used furniture business. Whether you want to buy or sell used furniture, there are plenty of ways to do it. A consignment shop is a retail store that stocks and sells merchandise on consignment. Consigning an item involves giving it to the store for them to sell and you get some of the sales income or store credit for those items. At some places, you can retrieve your items that do not sell after a certain number of days. 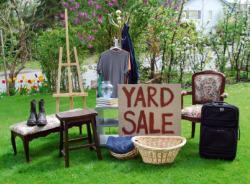 Garage sales are small sales put on by people looking to sell a few items for low prices. They often take place outside of a person's home (hence the name) and last for a few hours. Shops that sell used articles, especially clothing, in order to benefit a charitable organization. Instead of purchasing items from sellers they usually rely on donations. An antique shop is a retail store specializing in the selling of antiques (items around or over 100 years old). An auction is a process of buying and selling items by offering them up for bid, and then selling them to the highest bidder. They range from very large and high-end versions to small and inexpensive varieties. With the rise in popularity of the Internet, online auction sites like eBay have become very popular. The classified sections of newspapers, and online classifieds sites like Craigslist allow people to advertise items for sale. People interested in the item can then contact the seller directly. Become familiar with the styles and characteristics of furniture periods you like so you can recognize the real thing when you see it. Assess the condition of items and decide whether the asking price is worth it. While a little wear and tear is to be expected with used pieces, serious cracks and damage are cause for worry. Think about how much time and money you want to put into the piece. Will it require reupholstering or restoration? If so, take that cost into account when deciding whether or not to purchase it. Ask the seller if there's any room for price negotiation. While they're under no obligation to lower prices, they may be willing to take off a certain amount in order to sell the item quickly. There are many ways to sell used furniture. You can ask local stores if they'd like to buy it from you, sell it on consignment, place an ad in the newspaper, or sell it through an auction. No matter how you choose to sell used furniture there are some important things to keep in mind. Do some research and figure out what your item is worth. Take into consideration the age, style, and condition. Set a price and try to stick to it. If you don't get a buyer, hold on and try again in a few weeks or so. People will always try to negotiate for a lower price, so set a minimum price you're willing to accept and stick to your guns. Know your market. Consider whether the item you're selling is likely to appeal to people in the area or if you're going to have to access a wider region. If you don't think that something will sell in a consignment shop in your area consider selling it online. Think about how much time you want to devote to selling. Putting an ad in the classified section of the paper or on Craigslist may not be the best way to make a lot of money but it's often quick and easy. Used furniture buying can be a great hobby, and an even better business. There are plenty of ways to do it, so get out there and give it a shot.